Jerry Hofacker, 79 of Celina, OH died 8:11 a.m. Saturday March 30, 2019 at St. Rita's Medical Center in Lima, OH. He was born June 7, 1939 in Brookville, OH to A. Earl Harger and Ruth Hofacker. He was raised by his adoptive mother, Irene Hamm. On November 29, 1996 in Sevierville, TN he married Marilyn Newbauer, who survives. 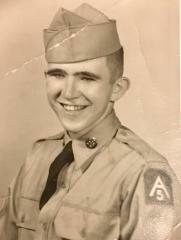 He was a veteran of the United States Army, having served during the Korean War. He retired from the FRAM Corp. in Greenville, OH, where he worked as a security guard. His favorite pastimes included fishing, watching television and spending time with his grandchildren. Services are scheduled to begin 7:00 p.m. Wednesday April 3, 2019 at the Miller Funeral Home 1605 Celina Road (Ohio 703 West Chapel) in St. Marys. Visitation 5 - 7 p.m. on Wednesday at the funeral home. Military funeral honors will be presented at the conclusion of the funeral services.